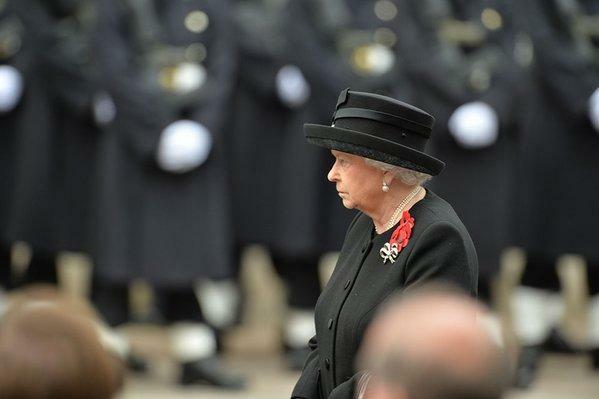 The Queen and the Duke of Edinburgh, accompanied by The King and Queen of the Netherlands and other members of the Royal Family, attended the Remembrance Sunday ceremony at the Cenotaph, London. The service honors those that have died in armed conflicts. 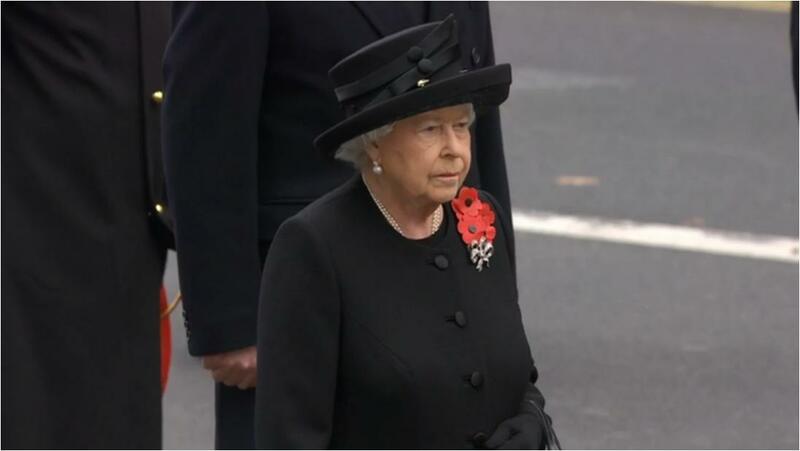 As she does each year, The Queen selected one of her of diamond bow brooches to fasten her poppies for today's service at the Cenotaph. Queen Victoria's Brooch is actually not a regular selection here, because she often goes for one of the larger bow options. She wore the larger set of Queen Mary's diamond and pearl earrings, which is also not a usual selection for this event. Also unusual: The Queen invited another monarch to the ceremony. King Willem-Alexander was invited to mark the 70th anniversary of the liberation of the Netherlands. The note, signed by both King Willem-Alexander and Queen Máxima, says: "In remembrance of the British men and women who gave their lives for our freedom. The Kingdom of the Netherlands will be forever grateful for the British role in its liberation." 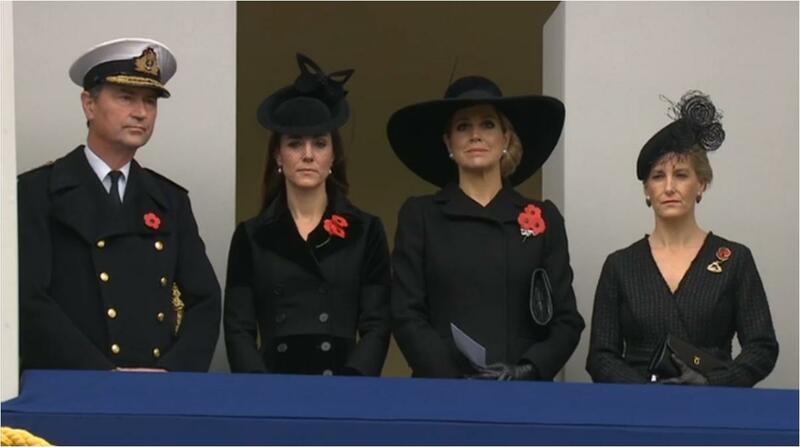 On another balcony, Princess Michael of Kent, The Duke and Duchess of Gloucester, and Princess Alexandra of Kent looked on. The Duchess and Princess Alexandra both wore military badges. In another first for the day, Prince Harry laid his own wreath. 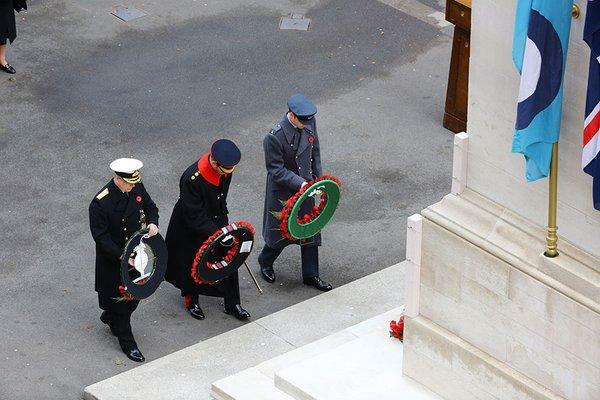 Though Harry has laid a wreath on behalf of his father in the past, this was the first time he has done so in his own right. He joined The Duke of York and The Duke of Cambridge, above. Apart from The Queen and The Duke of Edinburgh, other members of the Royal Family laid wreaths in groups this year to help shorten the ceremony, after discussions about cutting down the amount of time veterans are required to stand during the event. 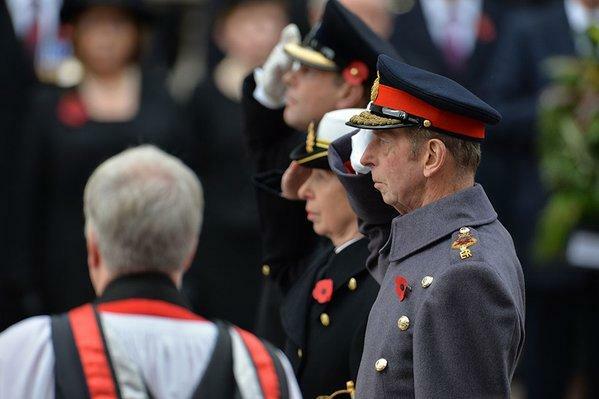 Above, The Duke of Kent, The Princess Royal, and The Earl of Wessex give their salutes together after placing their wreaths. And finally, after the Cenotaph ceremony, Prince William took the veterans' salute at Horse Guards Parade (another first, I believe). For more on Remembrance Sunday: BBC article and video, Zimbio gallery.